Welcome to the 2013 Annual Faith in Action Stewardship Appeal. 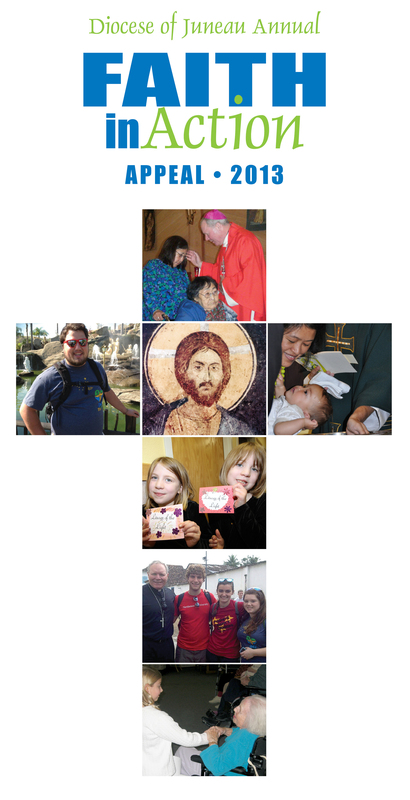 The theme of Faith in Action this year is the same as that for our Second Diocesan Synod, which will meet this November: “People of God Responding to Christ’s Call.” Looking ahead from this Year of Faith, this is a call to discipleship and an opportunity to serve others in our parishes and our Diocese. It is the same experience as when Jesus called his disciples to follow him! The meaning of stewardship must be based in the meaning of discipleship. To be stewards requires that we first be disciples. Jesus first calls us to be his disciples, and then we respond as stewards by using our time, talent, and treasure. Throughout this Year of Faith we have been exploring the ways in which we have the opportunity to do this, an exploration that will culminate in our Second Diocesan Synod. I hope that a result of this Year of Faith in Southeast Alaska, and of our Diocesan Synod, will be a better understanding of stewardship and discipleship within our Diocese. Stewardship is a commitment of mind and heart to the Lord, a way of living by which we give thanks to God. The call of discipleship is a call to serve others. As the seed of God’s Word falls on good ground, it will yield a rich harvest. The good soil represents those who respond faithfully to God’s Word. The question for Christian stewards is, “What kind of soil are we?” We need to examine our lives regularly to see how the harvest of salvation is growing in us. In order to produce the fruitful harvest, we must share the time, talent, and treasure that God has entrusted to us. Working together we can make a difference. This is how we live out the call of Jesus to be his disciples. Thank you for your participation in our Faith in Action Appeal, as we strive to be disciples of the Lord and stewards of his many gifts. Click here for a downloadable brochure and contribution form.